Adorn your holiday table with this wonderful Moroccan savory pie. It’s as elegant as it is scrumptious. 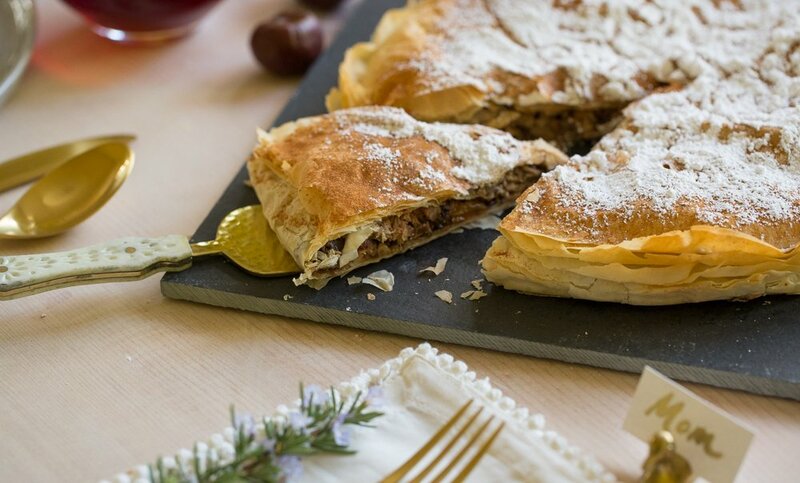 Layers of flaky pastry contain a meat filling, scented with cinnamon and sweetened with dates. Little do they know that you made it with Thanksgiving leftovers. What’s so nice about this dish is that you can assemble the whole thing on Thanksgiving weekend, pop it in the freezer and forget about it until the end-of-year holidays. Then, when you’re in the throes of family, friends and holiday madness, all you have to do is pop it in the oven, open some wine, and have a wonderful meal. After Turkey Day, pick your bird clean. By hand is the best way to do this, shredding the meat with your fingers as you go. Many hands make quick work! Once the bird is bare, simmer the carcass for a stock that you’ll use in this recipe. Any extra is great for soup, risotto, and more. Begin by sautéing the onions and garlic. Use butter, or if you have it, pan drippings from the Thanksgiving turkey. Once you add the cinnamon sticks, the room will start smelling delicious. Add dried fruit and some of the turkey stock. Allow this to reduce, and then add the turkey meat. 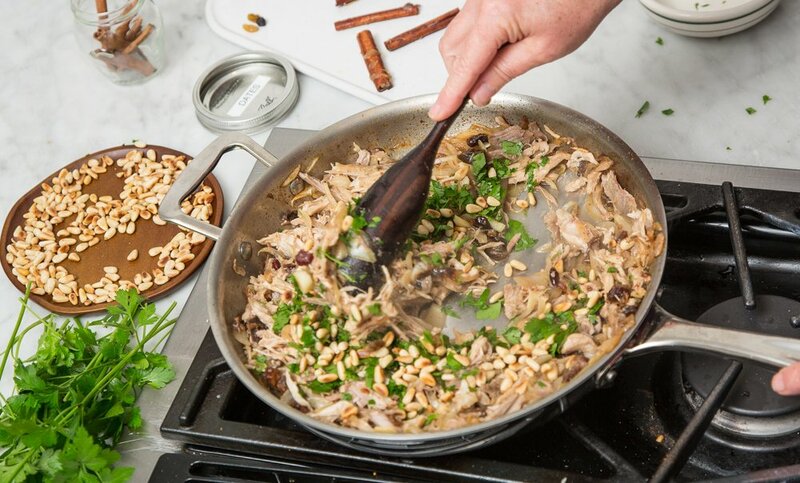 To finish, remove the heat and stir in the toasted pine nuts and parsley. Feel free to make the dish in stages. You can always pop the finished filling in the fridge, and assemble the b’stilla later. Assembly time: Brush the phyllo with butter and layer, layer, layer. The more you do, the flakier your pie! As you put each piece of phyllo on the tart pan, allow the sheets to hang beyond the edges of the tart pan (you’ll tuck them in later.) 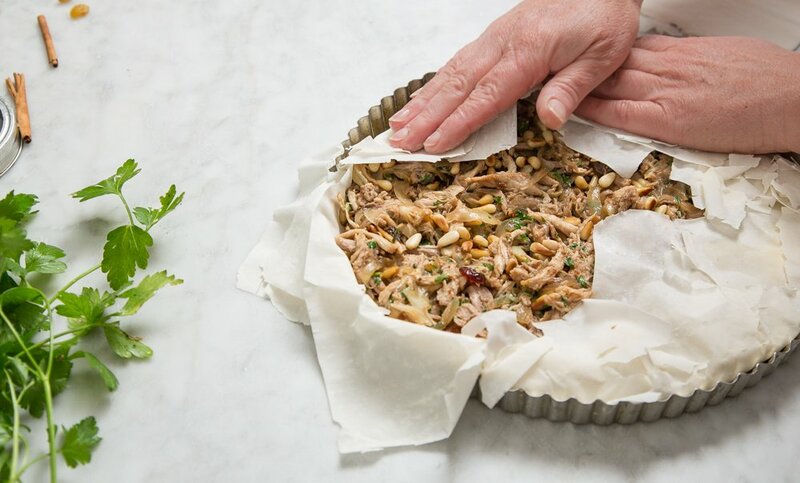 Work concentrically — keep rotating the pan so the phyllo hangs over at different intervals. You want this to happen so that when you add the meat filling, it will be nicely nestled. Once all about 10 or so sheets are on the tart pan, press down along the inside edge of the tin. Add the filling, and then tuck in the hanging phyllo sheets. Add some more butter-brushed layers of phyllo on the top of the pie, trim, and tuck. Brush your finished masterpiece liberally with butter. Wrap as well as possible in plastic wrap, and pop this into your freezer. On the big night, preheat your oven to 375°F. Remove the b’stilla from the freezer, unwrap and toss in the oven. (There’s no need to thaw.) A dusting of powdered sugar is all the effort you’ll need for a gorgeous & flaky, sweet & savory pie. 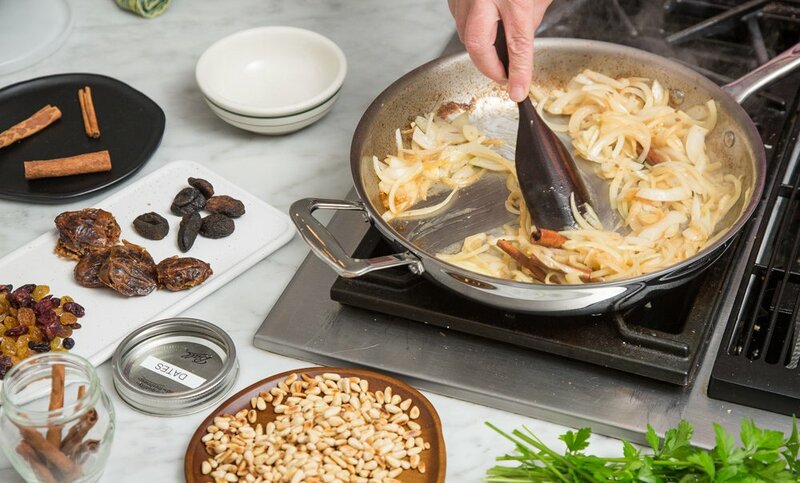 When most of the stock has been absorbed or evaporated, remove the pan from the heat and stir in the pine nuts, and parsley. Add a pinch of salt and a few grinds of black pepper. Allow the filling to cool. Assemble the b’stilla: Melt the remainder of the butter and keep handy. Unroll the phyllo dough, and cut, using the tart pan as a guide for how large a square of pastry to use. Wrap the remaining dough in plastic wrap and pop back in the freezer for another use. 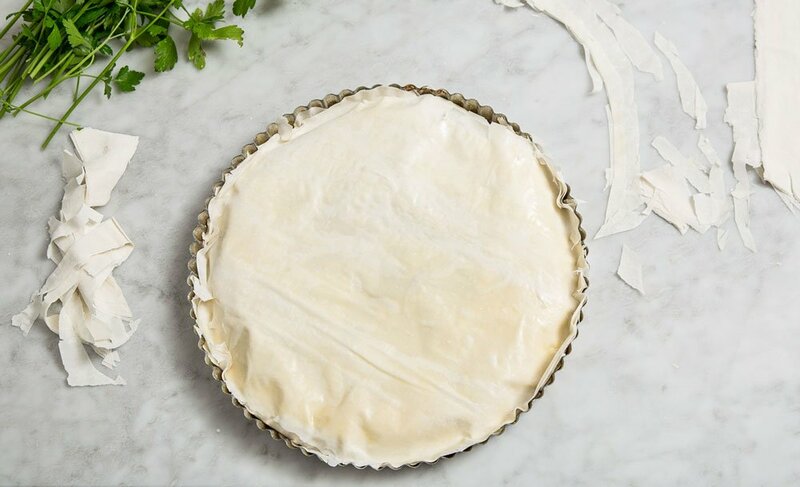 Next, brush one sheet of phyllo with butter and place atop the tart pan — the edges should spill over beyond the pan. Repeat the process with at least 9 more sheets of phyllo. 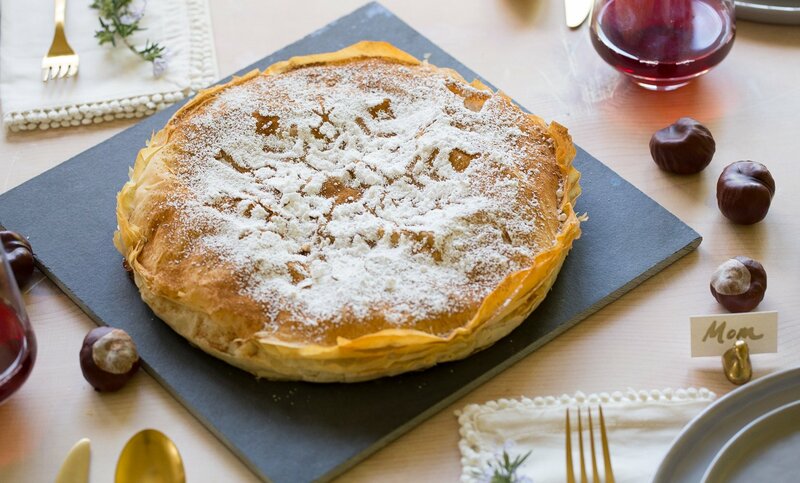 Work concentrically — keep rotating the tart pan so the phyllo hangs over at different intervals. You want this to happen so that once you add the meat filling, it will be nicely nestled. Once all about 10 or so sheets are on the tart pan, press down along the inside edge of the tin. Add the filling, and then fold over the over-hanging phyllo sheets. Continue adding about 5 more sheets of pastry to the top of the b’stilla, then trim those sheets with a scissor, and tuck in the edges. Brush the top with melted butter. Voila! This beauty is ready to freeze. Before popping it in the freezer for an extended time, make sure to wrap it well. When you’re ready to have a fabulous meal, preheat your oven to 375°F. Remove the b’stilla from the freezer, unwrap and toss in the oven. (There’s no need to thaw.) Bake about 45 minutes, until the top is golden and flakey. Allow it to cool for a few beats. Remove from the pan, sprinkle with powdered sugar and serve.